Touchnet is the service employed by UW-Stout for students and their delegates to view bills, make payments and manage accounts. The "Make a Payment" link from the Student Business Services site takes the user to the Touchnet Login (the campus payment page). Active Students: Active students can log into the "Students and Staff" login using their Stout Username and password. Rule of thumb: log in using the same username and password combination you would use to log into Access Stout. Past/Inactive Students (including alumni): Students who are not active (not enrolled for approximately 13 months or more) will not be able to log in and should contact Student Business Services for an alternative payment option. 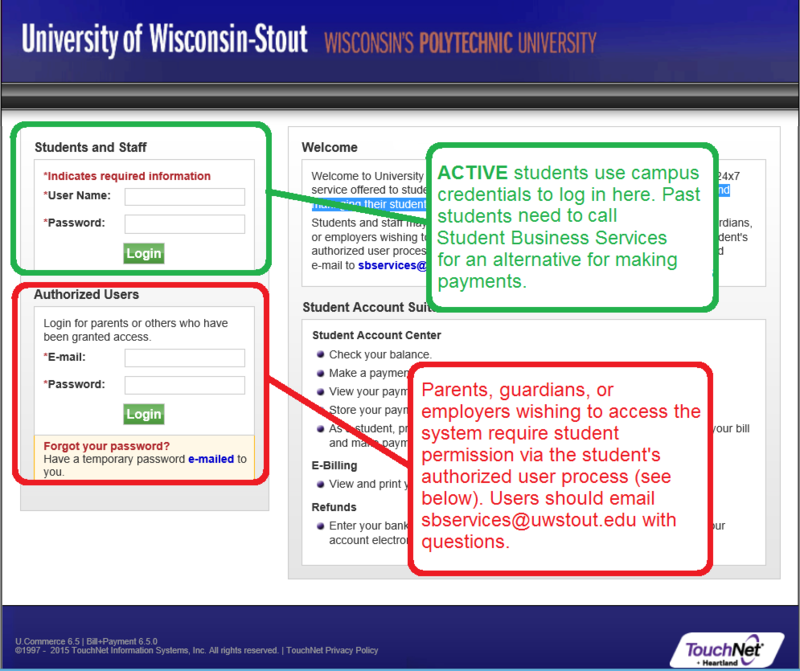 Rule of thumb: Students who cannot log into Access Stout cannot use the online payment site. Parents/Guardians/Employers: Parents, guardians, or employers wishing to access the payment system require student permission via the student's authorized user process before they can log into the Authorized Users login. The password used to log in is established by the delegate and initiated via an email to their personal account. Forgotten passwords cannot be recovered; the student must reinitiate the process. Users should email Student Business Services with questions.